4.1 out of 5 based on 86 bloggers and 7 commenters. 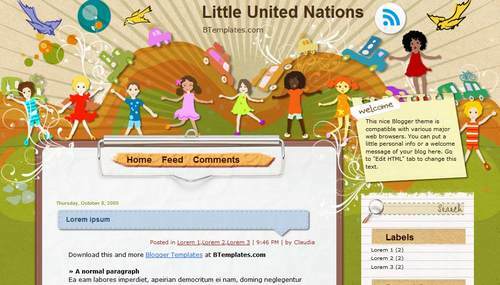 Little United Nations is a free blogger template adapted from WordPress with 2 columns and right sidebar. One thing I really need to understand is that since I have uploaded this template, I cannot see the links on the top right of my blogger page, the ones that were New Post, Dashboard, Settings etc. Can you please help me to configure the same? @Debolina Raja Gupta You can find the answer to your questions and more in our FAQ section. to my own welcome note at the EDIT HTML and I made a mistake. Now the Welcome sign is empty and the following message is on the template. Could you please help me out? @Agapi Liapaki: Go to Design/Page Elements. You should find an empty HTML gadget where you cam write your own welcome text. If it does not work, go to Design/Edit HTML, find that welcome message and replace it by your own. I am having a same problem. Can someone guide us?